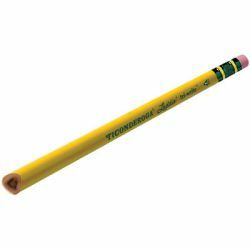 Catalog Home > "Laddie Tri-Write Primary Pencils, with Eraser"
"Laddie Tri-Write Primary Pencils, with Eraser"
This intermediate size (11/32") triangular No. 2 pencil makes moving from printing to cursive writing a comfortable transition. PMA certified non-toxic and the finish contains microban®. This pencil comes with an eraser and contains 36 pencils per box.